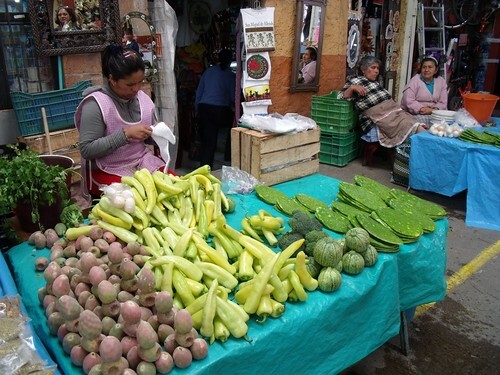 Somehow, everything I ate in Mexico became “this is my absolute favourite vegetable! !” or “this is my favourite food ever!! 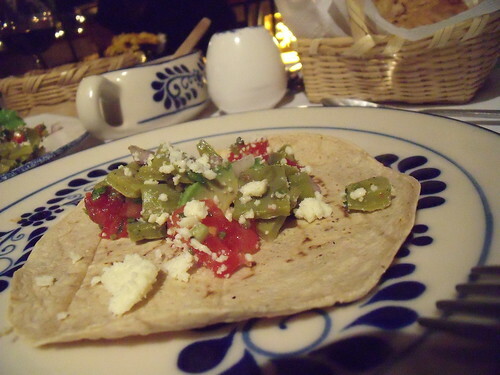 !” And nopales (cactus) has become one of my favourite vegetables. The best way to prepare them? Well, it’s a little labour intensive, but well-worth the efforts: first, you boil the leaves in water until they become tender. Then you slice them into strips, and sauté them with onions, olive oil, green chile, oregano, and salt. 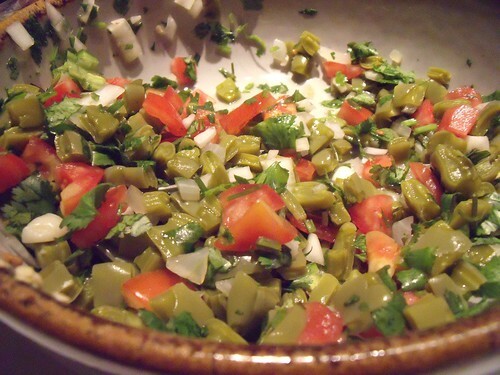 Let cool and toss with cilantro and diced tomato. Mmm, perfection. And in our first night’s salad, with mild goat’s cheese and avocado . . .
. . . which I promptly put into a corn tortilla. Now to see if I can find myself a good nopales source here in Toronto… wish me luck! Wow, this might be the only thing we can get here in Nebraska that you can’t get in Toronto! 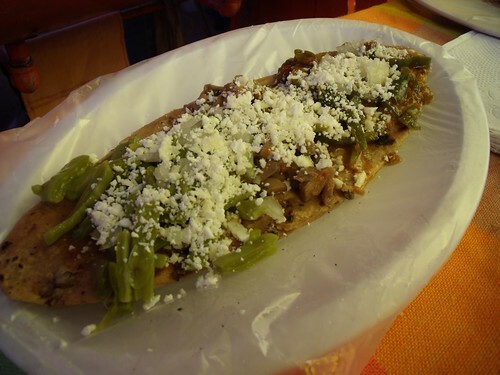 We have a very large Mexican population, so it’s easy to get authentic Mexican foods (just not anything else). If you can’t find it by June, I’ll make you some when you come to visit!! I could bring some from Chicago! I’m going to hit up Kensington Market this weekend, before we worry about bringing veggies cross-border. Kristen — *jealous*, good thing I’m coming to visit! ooo yum! 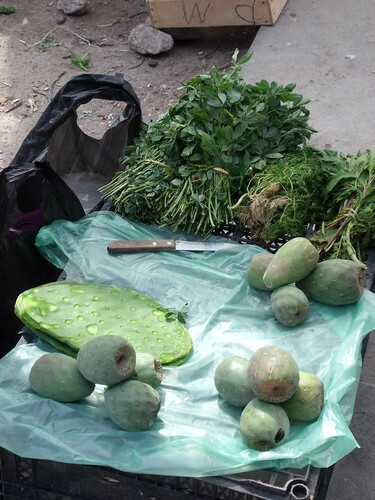 I grew up eating ‘nopales’ – only we called them ‘prickly pears’ – they grown on my parents’ farm in South Africa! Mmm, how did you eat them, Paddy? Mmm, so you had them as dessert — sounds divine! Now I must get some! 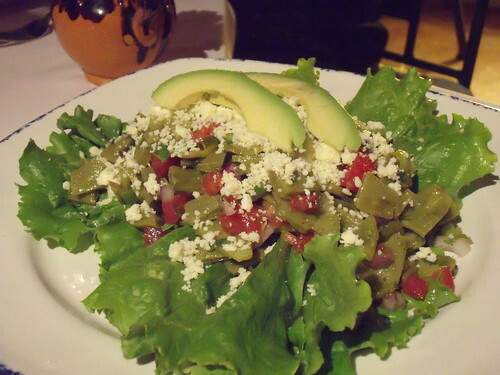 I was wondering if you ever found nopales in Toronto? I’d love to know! Yes!! I’ve found them for purchase in several Latin food markets in Kensington Market, and already made to eat in some of the restaurants! Yum!